Keep your logo on display all year round with this customizable 5″ x 7″ earth-friendly bamboo picture frame. 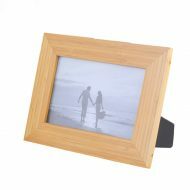 This bamboo wood picture frame exemplifies ecological awareness while adding warmth and rustic glow to your snapshots. Laser Engraved with your logo either landscape or portrait, this promotional picture frame makes a unique and attractive giveaway that can be used in various promotions. Order today! Keep your logo on display all year round with this beautiful, earth-friendly 4″ x 6″ bamboo wood picture frame. 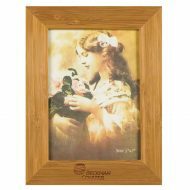 This natural picture frame exemplifies ecological awareness while adding warmth and rustic glow to your snapshots. Laser Engraved with your logo either landscape or portrait orientation, this promotional picture frame makes a great welcome gift for employees, a thank you gift for clients, and can be used in various promotions. Order today! Constructed from natural pine wood with a plastic liner designed to protect the wood from water damage. 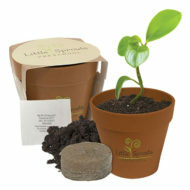 Includes wooden cube planter, seed packet, peat pellet, and packaging wrap with printed planting instructions. Choose from one of 12 available seed options (see below). Pricing includes a one color imprint in 1 location on wooden cube with full-color logo on top of packaging wrap. Need it Faster? Rush Production Available – Please Inquire! Constructed from natural pine wood with a plastic liner designed to protect the wood from water damage. 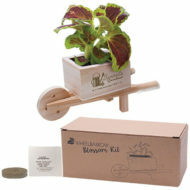 Includes wooden wheel barrow planter, seed packet, peat pellet, and natural kraft box with printed planting instructions. Choose from 12 available seed options (see below). Included are 1 seed packet (specify on order), 1 peat pellet, wood wheel barrow planter w/plastic liner, and natural kraft box. 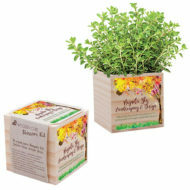 Comes imprinted with your company logo and message on a planter, and a full-color imprint on top of the packaging.